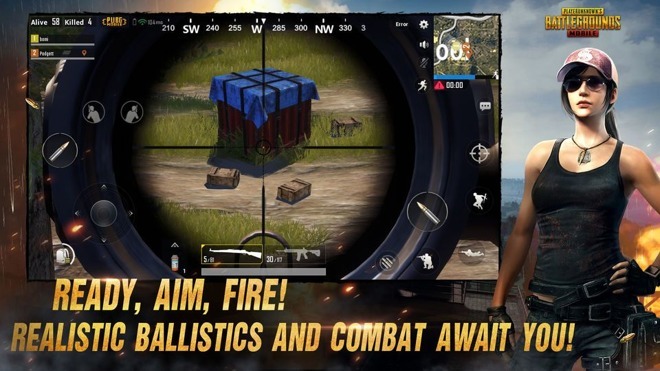 Not to be outdone by Epic's Fortnite, Tencent's licensed version of PlayerUnknown's Battlegrounds — better known as PUBG — is now officially available for the iPhone and iPad. The iOS game is described as an "authentic port" of the original PC title, using similar graphics and sound running on Unreal Engine 4. A battle royale style shooter, each match has up to 100 players fighting on an 8-by-8-kilometer battlefield littered with weapons and vehicles. Players drop into the map without armaments, pick up guns and ammo as they find them and do battle in buildings, across open fields and even on water. The last player standing is the winner. Tencent promises that the mobile version has "powerful anti-cheating mechanisms," and is optimized for a variety of devices. This includes touch controls for commands like leaning, crouching, and changing weapons, as well as voice chat when participating in squad battles. The game is expected to get more features and optimization over time, again like its PC counterpart. Battlegrounds is a free download for devices with iOS 9 or later, though Tencent suggests playing on at least an iPhone 6.